Every night at six o’clock baby Donna and her mother Audrey Butterglove ‘con’ the bathroom for an hour. This is their special time together, girl time, bath time, a time for talking, giggling and play as well as a time for soap and shampoo. 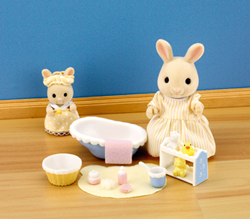 In her little baby bath, full of her favourite toys Donna holds court with her tale of her days adventure while mother gently cleans away the tell tale signs of that busy day.